Видимо, не подлежит сомнению, что самым знаменитым семейным кланом в современном джазе остается семейство Марсалисов. Но альбом Grace знакомит нас с также весьма креативным и интересным семейным бэндом. И хотя на обложке альбома стоит только имя отца семейства, Марка Уитфилда, это действительно настоящий family band, который Марк Уитфилд представил публике своим пятнадцатым по счету диском. В записи альбома Grace участвовал квартет во главе с гитаристом Марком Уитфилдом, за ударными – его старший сын Марк Уитфилд-младший, за роялем – его младший сын Дэвис (не могу утверждать, но возможно он получил это имя в честь дяди, тоже известного джазового музыканта, барабанщика Троя Дэвиса), и только на басу играет человек, не связанный с остальными кровными узами – Ясуши Накамура, названный лидером в liner notes альбома «почетным членом семьи Уитфилд». Для точности добавим, что в титульной композиции к инструментальным голосам добавляется очень приятный человеческий голос – голос вокалистки Сай Смит. Собственно, о семейном бэнде можно было говорить с 1994 года, когда в одной из телепрограмм на День Благодарения вместе с квартетом Уитфилда на сцену вышел 4-хлетний барабанщик Марк-младший. Его папа к тому времени был уже известным гитаристом, наделав шуму своим дебютным альбомом Marksman в 1990 году, когда New York Times назвала его «лучшим молодым гитаристом в бизнесе». С тех пор карьера Марка только укреплялась, хотя сегодня молодым гитаристом его уже не назовешь. Но мастерство никуда не делось. В девяти композициях полностью авторского альбома его гитара марки Marchione непостижимо гибко скользит между фьюжн и смус-джазом, не позволяя в полной мере отнести музыку Уитфилда ни к одной, ни к другой стилистике. Марк в полной мере использует разнообразные гитарные эффекты, но нигде не делает на них главный акцент, он виртуозен, как, напрbмер, в Space Between Us, но техника никогда не остается для него самоцелью. Музыка Grace, легкая и стремительная, несется вдаль, заметно повышая тонус слушателю на протяжении часа с небольшим. Слушая альбом, я долго пытался понять, кого же мне напоминает Марк Уитфилд, и только пресс-релиз к альбому помог разрешить проблему: ну конечно, Джорджа Бенсона! Именно Бенсона Марк считает своим главным учителем. Как говорит сам музыкант, именно альбом Джорджа Breezin’ был первым гитарным диском, попавшим в свое время к нему в руки. Бенсону посвящены и к его творчеству отсылают в Grace такие композиции, как Double Trouble и Fortress, а к числу самых ярких вещей альбома я добавил бы еще и очень притягательную Undiscovered. Дети отца в этой записи также не подвели. Кстати, и Марк-младший, и Дэвис, как и их отец, успели уже окончить Беркли, и, каждый своим путем, прокладывают путь к джазовым вершинам. Ну, а когда вся семья в сборе (в записи незримо присутствует и мама Марка-младшего и Дэвиса: альбом назван Grace именно в ее честь), силы удесятеряются, а творческая энергия бьет через край, что и дает почувствовать этот альбом, появившийся на прилавках музыкальных магазинов в конце января 2017-го. Apparently, there is no doubt that the most famous family clan in modern jazz remains Marsalis family. But Grace album also introduces us to a very interesting and creative Family Band. And though on the album cover is just the name of the father of the family, Mark Whitfield, it's really a real family band, which Mark Whitfield presented to the public his fifteenth disc. The album Grace was a quartet led by guitarist Mark Whitfield, on drums - his eldest son, Mark Whitfield, Jr., at the piano - his youngest son Davis (I can not say, but perhaps he has received this name in honor of his uncle, also a famous jazz musician , drummer Troy Davis), and only plays the bass man, not connected with the other by blood - Yasushi Nakamura, named leader in the liner notes of the album "an honorary member of the Whitfield family." To be precise to add that in the title of the composition to the instrumental voices add a very nice human voice - the voice of the vocalist Sy Smith. Actually, a family can be a band, say in 1994, when in one of the TV on Thanksgiving Day, along with a quartet of Whitefield came on stage 4 hletny drummer Mark Jr. His dad at that time was already a famous guitarist, created a sensation with their debut album Marksman in 1990, when the New York Times called it "the best young guitarist in the business." Since then, Mark's career only strengthened, although today it is no longer called the young guitarist. But the skill is still there. Nine compositions full copyright of the album his guitar brand Marchione incomprehensible slides flexibly between fusion and jazz-Smoothie, not allowing to fully include music Whitfield neither one nor the other style. Mark takes full advantage of a variety of guitar effects, but never makes them the main focus, he virtuoso, as naprbmer in Space Between Us, but the technique is never an end in itself for him. Grace Music, light and swift, rushing into the distance, significantly increasing the tone of the listener for hours with little. Listening to the album, I tried to understand, whom reminds me of Mark Whitfield, and only the press release for the album helped to solve the problem: Well, of course, George Benson! That Mark Benson says his main teacher. As the musician says it is an album of George Breezin 'was the first guitar drive, find themselves at one time into his hands. Benson and devoted to his work in Grace send such compositions as Double Trouble, and Fortress, and one of the most striking things I would add the album is also very attractive Undiscovered. The children's father in this record also did not disappoint. By the way, Mark Jr. and Davis, like their father, have already managed to graduate from Berkeley and, each in their own way, paving the way to the heights of jazz. 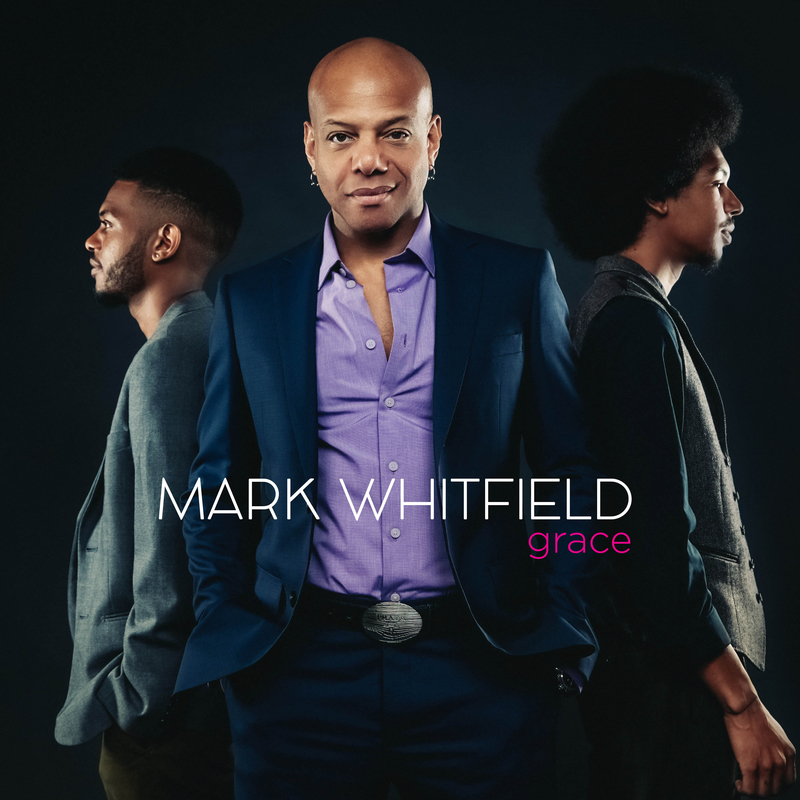 Well, when the whole family is assembled (in the recording invisibly present and mother of Mark, Jr. and Davis: album called Grace is in her honor), strength increased tenfold, and the creative energy brims over, which gives the feeling that the album, which appeared on the shelves record stores in late January 2017. I remember Mark Whitfield from its beginnings in 1990 with "The Marksman" and immediately after the very good "Patrice". Both from Warner, at a time when large companies closely looking the next stars of jazz, among the Berklee graduates. With flawless guitar technique, influenced mainly by George Benson and a sound dynamic and sweet, which incorporated elements from R & B, the soul and gospel, always within the context of the mainstream, the young New Yorker seemed to have the makings do it. Twenty five years later and a dozen albums to have occurred, the basic components of music have not changed much. The "Grace" (Marksman Productions) comes to an end in the recording gap that followed the "Songs of Wonder" (2009), a somewhat lukewarm tribute to Stevie Wonder. For this "reboot" certainly played a role and that within this period the two sons of guitarist emerged to deserving colleagues. So having on his side to Davis on piano and Mark Jr. on drums, not needed despite a bassist to complete the group, a position which gave Yasushi Nakamura. And nine pieces of "Grace" have the signing of Whitfield father, with only short "Pulse Pt. 2 "to close the CD, be countersigned by Davis. The album starts with the strong pace of "Afro Samurai" which triggers the three Whitfield upload one after another the volume, while straight ahead "Blue DA" is dedicated Kenny Kirkland, who participated in the first appearance of the piece in 1994. Next is a switch between ballads and rhythmic tracks, with guitarist to do with great skill continuous references to George Benson (especially in "Double Trouble", the "the Socrates Curse" and "Fortress") and Davis -allote the classic, sometimes in electric piano- with Mark Jr. worthily stand beside him. Another family member, cousin Sy Smith, with the warm and soulful voice to lead and backing vocals, enriches the rhythmic ballad that gave the title to the beautiful album guitarist. Der Jazz. Die Gitarre. Die Familie. Mark Whitfield zeigt uns, wie es geht. „Grace“ ist das erste Album des mit vielerlei Stil-Wassern vertrauten Gitarristen seit 7 Jahren. Mit dabei – die Whitfield Family Band. Am Piano der Sohn Davis, am Schlagzeug der Sohn Mark Jr. – dazu Ehren-Familien-Mitglied Yasushi Nakamura am Bass. Das Saiten-Spiel des Vaters gibt den Ton vor – jederzeit flink, elegant, elektrisch und immer mit dem gewissen Ton, der den Jazz-Unterschied macht. Das Trio dazu gibt sich unverstärkt, aber nicht minder präsent. Als vorbildlicher Vorstand weiß Whitfield Snr. natürlich, dass man seinen talentierten Jungs genügend Raum für Spiel und Spaß einräumen sollte. Diesen nutzt das Brüder-Paar in nachhaltiger Manier – nicht nur als kongeniale Begleiter, sondern auch mit feinstem Solo-Spiel. Bassist Nakamura schließt sich tief-gründelnd an und gemeinsam begibt man sich auf eine durch-und-durch Modern-Jazz Berg-und Talfahrt, die ohne jegliche Abstecher in gefällige Smooth-Gefilde auskommt und so jederzeit zu überzeugen vermag. Das gilt übrigens auch für den Beitrag von Sy Smith, die als Freundin der Familie den Titel-Track mit einer Spur des neuen Soul so überzeugend bereichert, dass Pianist Davis auch mal das E-Piano anschließt. Jazz. Guitar. Family. Mark Whitfield shows us how to do it. "Grace" is the first album of the guitarist who has been familiar with many styles of playing for 7 years. With it - the Whitfield Family Band. On the piano is son Davis, on drums son Mark Jr. - and the honorary family member Yasushi Nakamura on the bass. The string play of the father sets the tone - at any time nimble, elegant, electric and always with the certain tone that makes the sound distinctive. The trio is unchallenged, but not less present. Whitfield Snr. Of course, that you should give your talented guys enough room for play and fun. The brethren couple use this in a sustainable manner - not only as a congenial companion, but also with the finest solo play. Bassist Nakamura joins deep-cuddling and together, one goes on a through-and-through-modern jazz mountain and downhill ride, which without any detours into complaisant Smooth-Gefilde manages and thus at any time convincing. This also applies to the contribution of Sy Smith, who is a cousin, enriches the title track with a trace of the new soul so convincingly that pianist Davis also joins the e-piano.